The article presents the preparation and characterization of Phospho-(Tyrosine)-Mimetic Calmodulin Mutants. Villalobo and al. prestents some very interesting properties after the characterisation of Phospho-(Tyrosine)-Mimetic Calmodulin Mutants. 4/ A Tb3+-emitted fluorescence upon tyrosine excitation. Some biochemical properties of these CaM mutants were also described such as their differential phosphorylation by the tyrosine kinase c-Src, and their action as compared to wild type, on the activity of two CaM-dependent enzymes: cyclic nucleotide phosphodiesterase 1 (PDE1) and endothelial nitric oxide synthase (eNOS) assayed in vitro. Silviya R. Stateva, Valentina Salas, Gustavo Benaim, Margarita Menéndez, Dolores Solís, Antonio Villalobo, Characterization of Phospho-(Tyrosine)-Mimetic Calmodulin Mutants, Plos one, 2015, DOI: 10.1371. OBC is delighted to announce a call for paper on Multivalent Biomolecular Recognition! 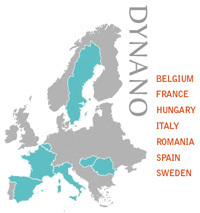 The 3 guest Editors: Dr. Mihai Barboiu (IEM, France), Prof Olof Ramström (KTH, Sweden) and Prof Stéphane Vincent (Univeristy of Namur, Belgium), all members of the EU-funded Dynanic Interactive Nanosystems ITN Marie Curie DYNANO Network, have been inspired for the themed issue in part by the area covered by DYNANO EU-project. Papers from colleagues of the network are indeed expected as well are welcome all articles from any contributors in the field who are not yet in the network. The understanding and control of multivalent biomolecular interactions has become one of the key frontiers of chemistry and biology. Unterstand the biomolecular mechanisms by exploring their synergistic adaptative interactions with biomolecules, in order to accurately control the chemical/biological responses. January 2015, Great release: Front Cover & Article in the latest issue of Chemical Communication! DNA. This discovery leads the possibility of further more DNA systems to self-selected and self-generate the most adapted carrier for their own active transfection. Dynamic Constitutional frameworks for DNA biomimetic recognition, Catana R., Barboiu M., Moleavin I., Clima L., Rotaru A. , Ursu EL. and Pinteala M., Chem. Comm., 2015, 51, 2021-2024. December 2014: Have a look at the last release of the Journal of pharmacy and pharmaceutical Science! Short review on the new axis in cancer therapy through the regulation exerted by the calcium-receptor protein calmodulin involving ErbB family receptor and the adaptator protein Grb7. To overcome problematic effects of CaM antagonists in cancer therapy. Potential new axis have been explored and presented here as targeting the site of action of CaM in CaM–binding systems to ErbB receptors and Grb7 protein. Both of them are found upregulated and /or overexpressed in tumors. A route to new potential anti-cancer therapy is open. Targeting the Calmodulin-regulated ErbB/Grb7 Signaling Axis in Cancer Therapy, Villalobo A., Garcia-Palmero I., Stateva S. R., and Jellali K., J. Pharm. Pharmaceut. Sci., 2013, 16(2), 52-64. December 2014: Have a look at the new release of JACS! The exchange of peptide fragment can be achieved by chemoselective and reversible NCL with a high degree of control on the location of the reversible bond in dynamic peptides/ proteins (orthogonality to the other peptides bonds is respected). The reactions is efficient in mild conditions (Physiologic pH, aqueous media) in the presence of DTT, with only small modifications of cysteine residue (N-methyl-cys) compatible with large range of bioassays and beyond. The original NCL methodology can be extended to further peptide bonds as long as a thiol group is present or introduced. This new methodology to build dynamic covalent peptides is of a great interest and potential for the discovery or release of new bioactive molecules or development of dynamic functional materials. Reversible Native Chemical Ligation: A facil Access to Dynamic Covalent Peptides, Y. Ruff; V. Garavini & N. Giuseppone, J. Am. Chem. Soc, 2014, 136, 6333-6339. June 2014: Do not miss the new Nature Communication! The 1ST supramolecular artificial model to show natural mimicking Gramicidin-A (gA) channel! The 1st route to conceive novel strategies for artificial channels mimicking nature (gA) was achieved by the collaboration between the NSA group at IEM, the ICGM team, both from Montpellier and the Fyles’ group from Victoria University, Canada. Synthetic triazole forming TCT compounds called “T-channel” have shown good example of primitive channel mimicking the simplest known natural channel (Gramicidin-A). Both theorical simulations and experiments reveal conduction through the T-channel similar to gA presenting proton/water conduction; cation/anion selectivity and a large open channel conductance states. Therefore, the association of supramolecular chirality with dipolar water alignment inside T-channels proved that they are a good model for artificial primitive mimic of gA! This discovery is of crucial relevance for the understanding of many biological events. An artificial primitive mimic of the Gramicidin-A channel, Barboiu, M.; Le Duc, Y.; Gilles, A.; Cazade, P.-A. ; Michau,M. ; Legrand, Y.-M.; Van Der Lee, A.; Coasne, B.; Parvizi, P.; Post, J. & Files, T. M.; Nat. Comm., 2014,DOI:10,1038/ncomms 5142.